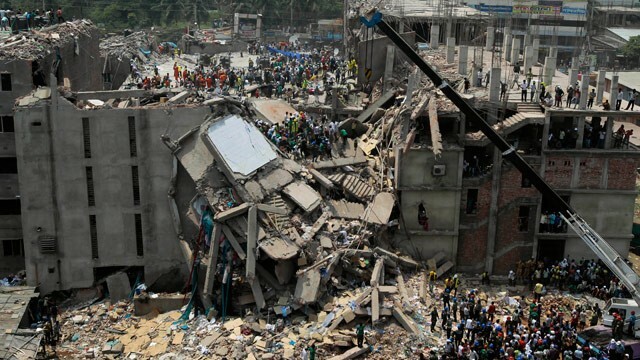 Last week, a garment factory collapsed in Bangladesh, India. Initial reports claimed that at least 87 people died in the accident, but the total of number of deaths from the collapse is now believed to be about four hundred, with thousands of others wounded. Massive cracks were reported in the building the day before the collapse, but the owner Mohammed Sohel Rana ignored the warning signs and demanded his employees keep working. On Sunday, April 28, Rana was arrested trying to flee Bangladesh, and will face responsibility for the collapse. This tragic story has understandably attracted much international attention. Unfortunately, it’s not the first time that an event like this has occurred. Last November, a fire at a different Bangladeshi garment factory killed 112 people (we wrote about it here). Another factory collapse eight years ago, killing 64. And these are just a few of the incidences of tragically unsafe working conditions in Bangladesh, where the garment industry brings in some $20 billion a year, but the workers typically make little more than $38 a month. 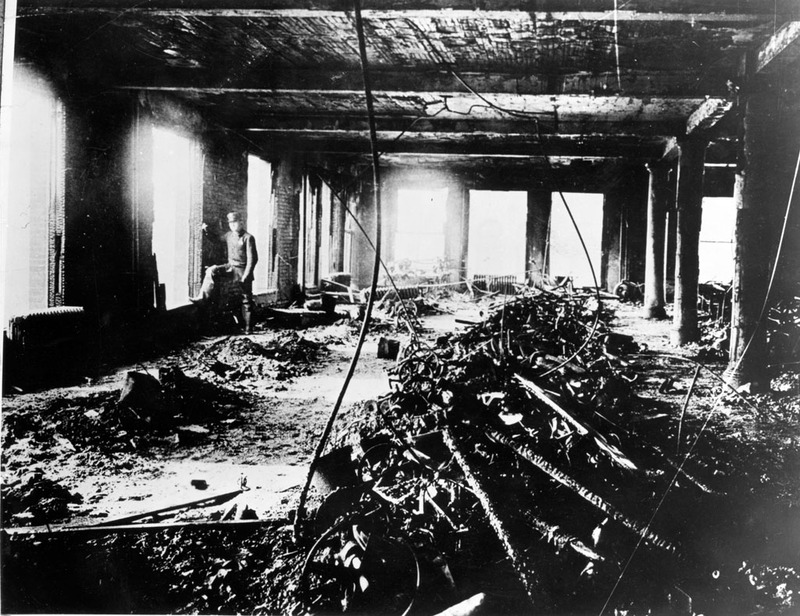 The wreckage of the Triangle Shirtwaist Factory. Hearing about these incidents, one is reminded of the Triangle Shirtwaist Factory fire of 1911. In that famous tragedy, 146 workers at a New York garment factory were killed when a fire broke out during work hours. The fire spread quickly due to unsafe work conditions, and workers were unable to escape the blaze because the factory’s owners had locked the doors in an effort to prevent the workers from taking unauthorized breaks. The fire attracted national attention, and prompted new laws and regulations in America to protect workers. Unfortunately, those laws are not in effect in other parts of the world, where sweat shops and unsafe conditions still are dominant. (That’s not to say that American companies don’t continue to flaunt rules and safety regulations: the Texas fertilizer plant that exploded on April 17, 2013, killing more than fifteen people and injuring many more, had 1,350 times the amount of explosive ammonium nitrate than what is allowed by the Department of Homeland Security on its premises.) But with the constant international scrutiny allowed by the internet, one hopes that things will change.The changes may even be made for economic reasons: in the wake of the Bangladesh collapse, many of the major corporations whose products are made there are working on plans to ensure worker safety. Meanwhile, the European Union is considering taking action against Bangladesh, threatening the preferential treatment the country receives from the Union that makes these factories so profitable. Sadly, like with the Triangle Shirtwaist Factory fire, it takes an unthinkable tragedy to spur any kind of action. To learn more about the Triangle Shirtwaist Factory fire, please check out The Triangle Shirtwaist Factory Fire (ISBN# 978-1-59935-099-8) by Donna Getzinger from your local library, or purchase it as an Ebook from Morgan Reynolds Publishing. Today marks the one hundredth anniversary of economist Milton Friedman’s birth. “Friedman was almost alone in many of his views during the first half of his career. But the power of his arguments and empirical findings began convincing more and more of his fellow economists that his free-market views were correct,” wrote Crain and Lee. And in 1976, Friedman won the Nobel Prize in Economics for his contributions to monetary theory and history. According to Cynthia Crain and Dwight Lee, authors of Profiles in Economics: Milton Friedman (a Morgan Reynolds title), in the 1940s and 50s, Milton Friedman, now famous for his theories on the free market and monetary policies, believed that “the nation was losing some of its freedom and opportunity. He believed that democratic capitalism was under attack; government control and regulation of the economy were on the rise. Freedom was being buried under an increasing number of government policies enacted to protect and take care of people and control the economy.” The cause for Friedman’s concern may once again be relevant to today’s economy, only this time with a slightly different spin. They want more and better jobs, more equal distribution of income, less profit (or no profit) for banks, lower compensation for bankers, and more strictures on banks with regard to negotiating consumer services such as mortgages and debit cards. They also want to reduce the influence that corporations–financial firms in particular–wield in politics, and they want a populist set of government priorities: bailouts for student debtors and mortgage holders, not just for banks. . . . Capitalism may have triumphed in China–even in Vietnam–but in America it’s in a quagmire. This is what has brought the protesters to Wall Street. But it’s not just America that’s suffering from the sagging weight of a stagnant economy. Europe has been working through its own financial woes as well. Countries are in serious debt from spending too much, and several banking institutions are imploding and having to be bailed out by their already indebted governments. Wearing slogans like “Get money out of politics,” the Occupy Wall Street protesters are arguing against financial institutions’ involvement with government policies and procedures. For more information on how the US economy has grown and evolved to become what it is today, check out Morgan Reynolds’s Profiles in Economics series.